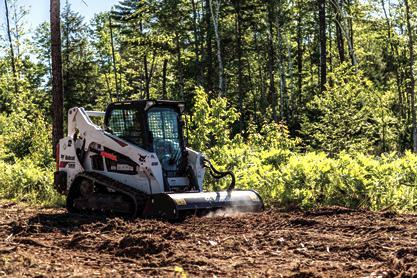 Break new ground with the tiller attachment. Tear through clumps and hardened materials with the replaceable, double-edge tines. Till and mix the soil with compost materials to prepare the ground. Built for easy and efficient soil preparation, the tiller attachment quickly turns a backyard plot into a soil bed for gardening. Bi-directional operation allows for top-cutting and under-cutting in either direction. Offset mounting even allows for tilling next to sidewalks and buildings, maximizing the versatility of tiller operation. Adjustable Skid Shoes: Deliver depth control for more precise tilling operation. Bi-Directional Rotation: Allows for top-cutting and under-cutting when operating in either direction, maximizing attachment versatility and increasing operating capabilities. Replaceable Tines: Hardened for maximum soil penetration, the double-edge tines break through clumps and tear through materials to deliver loosened soil for preparing the ground. Offset Mounting: Permits tilling next to sidewalks, curbs, and buildings, increasing jobsite capabilities of the tiller attachment. Direct Drive Hydraulic Motor: Delivers necessary operating power while reducing overall maintenance costs, extending the life of the attachment and eliminates the need for high wear items such as gear boxes, chains, sprockets and sheer pins. Bob-Tach® Mounting System: Turns any Bobcat® loader into a multi-job machine with a tight-fit attachment hook-up. Fast and easy attachment changes means spending less time on maintenance and more time on the job.